What Are the Benefits of Sesame Seeds? Like the term "Open Sesame" in Arabian Nights, the sesame seed pod also bursts open when it becomes mature. Sesame seeds have been in use as oil seeds for over 3000 years. It was once a major summer crop in the Middle East region, and then produced sesame oil by the invention of various ancient presses. Sesame seeds impart a nutty taste and a delicate crunch to recipes. It is the core ingredient in dishes like tahini, a kind of sesame seed paste, and a dessert called halvah which is made in Middle East. If you like the taste of it, now follow us to learn how to toast sesame seeds quickly. Given below are instructions using only 1 cup raw sesame seeds. The technique of toasting sesame seeds is important, even though the steps are simple to follow. Soak the sesame seeds in a bowl filled with cold water and stir. Brownish debris will float on the top, which should be removed. Strain and add water to the bowl. Rub the sesame seeds with hand, so they become clean. The water might turn brownish, which should be discarded. Wash under running water till water is clear. Squeeze out excess water. Heat a skillet or pan to medium heat and transfer the sesame seeds to it. Stir using a wooden spoon till they are dry. Seeds will start popping, then lower the heat and keep roasting for further 7-8 minutes. The seeds will turn golden, crisp and pop. Taste a few seeds, they should be crispy and nutty. If so, remove from pan and cool them. It can be stored in airtight container for a month or up to 3 months when stored in a freezer. 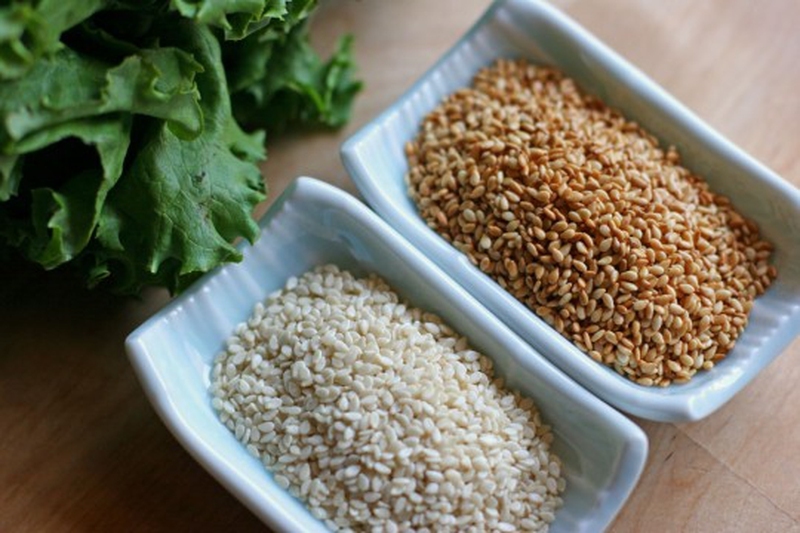 Toasted sesame seeds can be used in various dishes like breads, salads and rice. Here is a video you can watch to learn the procedure. Sesame seeds have been used by humans for its special taste. However, do you know that they also have nutritive, preventive and curative properties, which are good for our body? Sesame seeds are rich source of magnesium, which helps in lowering blood pressure. Research has also shown that using sesame oil can help reduce blood pressure in diabetics. Sesame seeds contain cancer-fighting compounds like magnesium, phytosterols and phytic acid. The phytosterol content is highest in sesame seeds as compared to other seeds and nuts. Magnesium is the key nutrient present in sesame seeds. It has been known to reduce the risk of getting diabetes and also helps in managing diabetes symptoms in people who are already diabetic. The bone health of the body is maintained and boosted due to the presence of minerals like calcium, zinc and phosphorus in sesame seeds. Fiber helps in smooth bowel movements by bulking up the stools. Sesame seeds have a good amount of fiber like other seeds and nuts. Sesame seeds contain good amount of the mineral copper which helps in reducing inflammation of joints, bones and muscles. This is especially beneficial for patients suffering from Arthritis. Sesame seeds contain an unusual organic compound called Sesamol, which protects DNA from radiation. People who follow the practice of oil pulling can make use of sesame oil, which has strong anti-bacterial and astringent properties on the oral health. Skin, hair and muscle tissue contains collagen. Zinc, which is present in high level in sesame seeds, is required during formation of collagen. Protein is required as building blocks of the body. Sesame seeds contain high amount of protein. The various bodily functions where protein is crucial include healthy cellular growth, mobility, metabolic functions, strength and energy levels.